Women in Papua New Guinea are chronically under-represented in all levels of government and business and face barriers to achieving a tertiary education. Those who do succeed must navigate a male dominated workforce, while a small formal sector and rising unemployment limit opportunities. 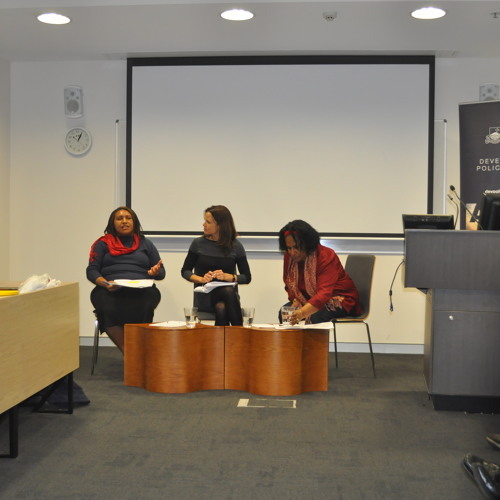 This event brought two prominent female professionals from Papua New Guinea to ANU to speak about their own experiences in this challenging environment and to share ideas on what can be done to increase women’s participation in the workforce, tertiary education and more widely. The speakers discussed challenges they have faced working in the public and private sectors and provided insights into the opportunities available to the new generation of Papua New Guinean women. Avia Koisen is a civil lawyer with more than 18 years’ of experience and is Principal of Koisen Lawyers, her own civil law firm in Port Moresby. Mrs Koisen is also one of the founding members and currently the Interim President of the Papua New Guinea Women’s Chamber of Commerce, established in 2013. Emma Wurr is Principal Legal Officer for Human Rights at the PNG Office of the Public Solicitor. Ms Wurr graduated with Honours from the University of Papua New Guinea in 2007 and has since held various positions in the Public Solicitor’s Office.